If only electric propulsion could operate at low voltage, maximize the motor’s performance and do without the cumbersome array of batteries. That’s the proposition advanced by KLD Energy Technologies of Austin, Tex., which suggests that it has come up with the next great innovation in electric-vehicle powertrains. Kicking off a Southern California media tour to showcase the oneDrive system the company introduced in June, Christian Okonsky, KLD’s founder and chief executive, and Ray Caamano, its chief scientific officer, expressed high expectations for the company, which is named for Mr. Okonsky’s sons, Keil, Luke and Dean. To demonstrate what KLD is capable of, the two men brought along three vehicles fitted with oneDrive: a scooter, a small utility truck styled like the Volkswagens Mr. Caamano has always loved and – just in time for Halloween – a two-seat rolling chassis nicknamed the Skeletor. The Skeletor is what’s known as a neighborhood electric vehicle, which is a class unto itself, distinct from golf carts. Mr. Okonsky, 49, is an engineer who worked for Dell, and is leading KLD’s adoption of regionalized production by contract manufacturers, patterned after Dell’s own method. Mr. Caamano, 50, is an inventor who claims 28 patents, most pertaining to the motor at the heart of KLD’s oneDrive integrated electric power system. KLD has 20 employees in Austin and 10 more at its Morgan Hill, Calif., research facility. Mr. Okonsky and Mr. Caamano first recognized kindred spirits in each other some years ago when discussing their admiration for Nikola Tesla. “We raised a lot of money to develop our technology over five years, and literally this month is the first that we’ve started shipping product,” Mr. Okonsky said in an interview. Mr. Caamano worked on Volkswagens after high school, perhaps informing the Skeletor’s compact rear-mounted drive system. It uses direct drive, with halfshafts supplying the power unit’s motive force to each rear wheel. Two motors, linked by an electronically controlled differential, are paired inside a drum, and master and slave controllers are mounted on top. A small battery pack supplied by Samsung is sandwiched under the seats. KLD created its own power-management software. Mr. Caamano said that California’s air pollution problems in the 1970s instilled in him a deep revulsion toward internal combustion that oriented him toward electric drive. He said he had spent 20 years working out his thoughts on oneDrive. 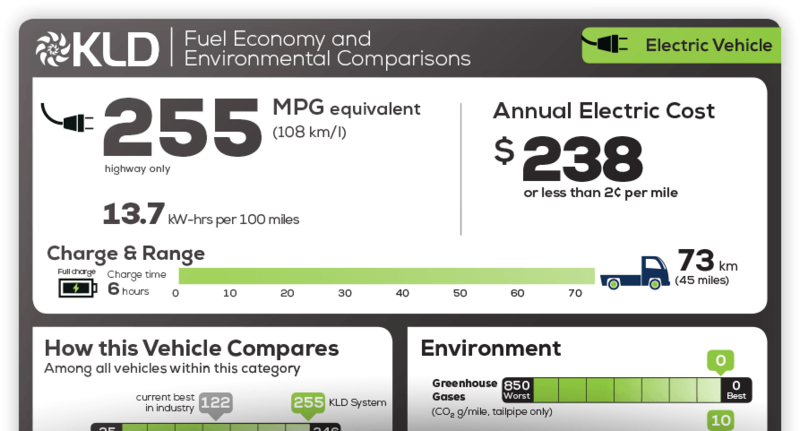 On KLD’s website, specifications for the neighborhood electric vehicle based on the Skeletor chassis list a top speed of 25 miles per hour and range of 24 miles from the 3.12-kilowatt-hour battery pack. In a test on local streets, the Skeletor accelerated smoothly and ran quietly, although its vaporous steering would have been rejected by a clown car manufacturer. March 19, 2019 - Rolls-Royce Completes First Ground Test of Hybrid-Electric Propulsion System FlyingRolls-Royce successfully tested a hybrid-electric propulsion system for aircraft that is based on its M250 turbine engine for helicopters. April 17, 2019 - Bye's Sunflyer rebranded as eFlyer CompositesWorldBye Aerospace (Englewood, Colo., U.S.) announced April 11 that it has rebranded its family of electric aircraft formerly known as Sun Flyer to eFlyer. George E.
April 3, 2019 - Electric Propulsion Shows Promise For Short-Haul Operations MRO NetworkNiche short-range operators see potential in converting their aircraft to electric power to reduce energy costs and emissions.